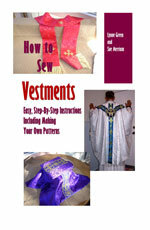 Need a general idea of the size of the device one should order for the front and back of a chasuble. Do You Mean the Vesica? Are you talking about the vesica? The design often attached to the back of the chasuble? If so, a vesica is usually about six to eight inches long and about four or five inches wide. You do not need to put a vesica on the front of the chasuble by the way, but only on the back. A vesica can be any liturgical design, from a cross to an embroidered Lamb of God. Any design that represents a season in the church.